SWOT analysis (or SWOT matrix) is a strategic planning technique used to help a person or organization identify strengths, weaknesses, opportunities, and threats related to business competition or project planning. It is intended to specify the objectives of the business venture or project and identify the internal and external factors that are favorable and unfavorable to achieving those objectives. Users of a SWOT analysis often ask and answer questions to generate meaningful information for each category to make the tool useful and identify their competitive advantage. 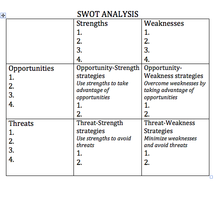 SWOT has been described as the tried-and-true tool of strategic analysis. Weaknesses: characteristics of the business that place the business or project at a disadvantage relative to others. Opportunities: elements in the environment that the business or project could exploit to its advantage. The degree to which the internal environment of the firm matches with the external environment is expressed by the concept of strategic fit. Identification of SWOTs is important because they can inform later steps in planning to achieve the objective. First, decision-makers should consider whether the objective is attainable, given the SWOTs. If the objective is not attainable, they must select a different objective and repeat the process. Some authors credit SWOT to Albert Humphrey, who led a convention at the Stanford Research Institute (now SRI International) in the 1960s and 1970s using data from Fortune 500 companies. However, Humphrey himself did not claim the creation of SWOT, and the origins remain obscure. Analysis may view the internal factors as strengths or as weaknesses depending upon their effect on the organization's objectives. What may represent strengths with respect to one objective may be weaknesses (distractions, competition) for another objective. The factors may include all of the 4Ps as well as personnel, finance, manufacturing capabilities, and so on. The usefulness of SWOT analysis is not limited to profit-seeking organizations. SWOT analysis may be used in any decision-making situation when a desired end-state (objective) is defined. Examples include non-profit organizations, governmental units, and individuals. SWOT analysis may also be used in pre-crisis planning and preventive crisis management. SWOT analysis may also be used in creating a recommendation during a viability study/survey. SWOT analysis can be used effectively to build organizational or personal strategy. Steps necessary to execute strategy-oriented analysis involve identification of internal and external factors (using the popular 2x2 matrix), selection and evaluation of the most important factors, and identification of relations existing between internal and external features. For instance, strong relations between strengths and opportunities can suggest good conditions in the company and allow using an aggressive strategy. On the other hand, strong interactions between weaknesses and threats could be analyzed as a potential warning and advice for using a defensive strategy. One way of using SWOT is matching and converting. Matching is used to find competitive advantage by matching the strengths to opportunities. Another tactic is to convert weaknesses or threats into strengths or opportunities. An example of a conversion strategy is to find new markets. If the threats or weaknesses cannot be converted, a company should try to minimize or avoid them. In many competitor analysis, marketers build detailed profiles of each competitor in the market, focusing especially on their relative competitive strengths and weaknesses using SWOT analysis. Marketing managers will examine each competitor's cost structure, sources of profits, resources and competencies, competitive positioning and product differentiation, degree of vertical integration, historical responses to industry developments, and other factors. The SWOT analysis has been used in community work as a tool to identify positive and negative factors within organizations, communities, and the broader society that promote or inhibit successful implementation of social services and social change efforts. It is used as a preliminary resource, assessing strengths, weaknesses, opportunities, and threats in a community served by a nonprofit or community organization. This organizing tool is best used in collaboration with community workers and/or community members before developing goals and objectives for a program design or implementing an organizing strategy. The SWOT analysis is a part of the planning for social change process and will not provide a strategic plan if used by itself. After a SWOT analysis is completed, a social change organization can turn the SWOT list into a series of recommendations to consider before developing a strategic plan. The physical environment —is your building in a growing part of town? Is the bus company cutting routes? Legislation — do new federal requirements make your job harder...or easier? Although the SWOT analysis was originally designed as an organizational method for business and industries, it has been replicated in various community work as a tool for identifying external and internal support to combat internal and external opposition. The SWOT analysis is necessary to provide direction to the next stages of the change process. It has been used by community organizers and community members to further social justice in the context of Social Work practice. As mentioned above, SWOT can be crucial to determining the success of a project, while factoring in funding, as well as accessibility and logic. Often, a city will spend a year weighing the Risk-benefits of a project before they even vote on it. Elements to consider in a SWOT analysis include understanding the community that a particular organization is working with. This can be done via public forums, listening campaigns, and informational interviews. Data collection will help inform the community members and workers when developing the SWOT analysis. A needs and assets assessment is tooling that can be used to identify the needs and existing resources of the community. When these assessments are done and data has been collected, an analysis of the community can be made that informs the SWOT analysis. A SWOT analysis is best developed in a group setting such as a work or community meeting. A facilitator can conduct the meeting by first explaining what a SWOT analysis is as well as identifying the meaning of each term. One way of facilitating the development of a SWOT analysis includes developing an example SWOT with the larger group then separating each group into smaller teams to present to the larger group after set amount of time. This allows for individuals, who may be silenced in a larger group setting, to contribute. Once the allotted time is up, the facilitator may record all the factors of each group onto a large document such as a poster board, and then the large group, as a collective, can go work through each of the threats and weaknesses to explore options that may be used to combat negative forces with the strengths and opportunities present within the organization and community. A SWOT meeting allows participants to creatively brainstorm, identify obstacles, and possibly strategize solutions/way forward to these limitations. The uses of a SWOT analysis by a community organization are as follows: to organize information, provide insight into barriers that may be present while engaging in social change processes, and identify strengths available that can be activated to counteract these barriers. To enhance "credibility of interpretation" to be used in presentation to leaders or key supporters. The SWOT analysis in social work practice framework is beneficial because it helps organizations decide whether or not an objective is obtainable and therefore enables organizations to set achievable goals, objectives, and steps to further the social change or community development effort. It enables organizers to take visions and produce practical and efficient outcomes that effect long-lasting change, and it helps organizations gather meaningful information to maximize their potential. Completing a SWOT analysis is a useful process regarding the consideration of key organizational priorities, such as gender and cultural diversity and fundraising objectives. Overall, managers should remember that SWOT is a starting point for discussion and cannot, in itself, show managers how to achieve a competitive advantage. Because the SWOT analysis is a snapshot of the firm at a particular moment in time, the analysis might obscure the fact that both the internal and external environment are rapidly changing. Some findings from Menon et al. (1999) and Hill and Westbrook (1997) have suggested that SWOT may harm performance and that "no-one subsequently used the outputs within the later stages of the strategy". Others have critiqued the misuse of the SWOT analysis as a technique that can be quickly designed without critical thought leading to a misrepresentation of strengths, weaknesses, opportunities, and threats within an organization's internal and external surroundings. If a firm becomes preoccupied with a single strength, such as cost control, they can neglect their weaknesses, such as product quality. Another limitation includes the development of a SWOT analysis simply to defend previously decided goals and objectives. This misuse leads to limitations on brainstorming possibilities and "real" identification of barriers. This misuse also places the organization’s interest above the well-being of the community. Further, a SWOT analysis should be developed as a collaborative with a variety of contributions made by participants including community members. The design of a SWOT analysis by one or two community workers is limiting to the realities of the forces, specifically external factors, and devalues the possible contributions of community members. Michael Porter developed the five forces framework as a reaction to SWOT, which he found lacking in rigor and ad hoc. Many reports have been published about the use of SWOT by real life companies, and how the idea is spreading.[which?] Coca-Cola has used this in their television ads in order to effectively target a customer, such as appeal to senses. In the Silicon Valley episode "Homicide" (Season 2, Episode 6), Jared Dunn (Zach Woods) introduces the Pied Piper team to SWOT analysis. Later in that episode Dinesh (Kumail Nanjiani) and Gilfoyle (Martin Starr) employ the method when deciding whether or not to inform a stunt driver that the calculations for his upcoming jump were performed incorrectly. ^ "SWOT Analysis: Discover New Opportunities, Manage and Eliminate Threats". www.mindtools.com. 1006. Retrieved 24 February 2018. ^ a b c d Dess, Gregory (2018). Strategic Management. United States: McGraw-Hill. p. 73. ISBN 9781259927621. ^ Humphrey, Albert (December 2005). 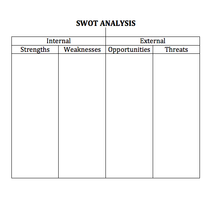 "SWOT Analysis for Management Consulting" (PDF). SRI Alumni Newsletter. SRI International. ^ "Albert Humphrey The "Father" of TAM". TAM UK. Retrieved 2012-06-03. ^ Blake, Martin; Wijetilaka, Shehan (26 February 2015). "5 tips to grow your start-up using SWOT analysis". Sydney. Retrieved 10 August 2015. ^ Osita, Christian; Onyebuchi, Idoko; Justina, Nzekwe (31 January 2014). "Organization's stability and productivity: the role of SWOT analysis" (PDF). 2 (9). International Journal of Innovative and Applied Research (2014): 23–32. Retrieved 17 March 2016. ^ a b c d e f g h i j k l "Community Toolbox: Section 14. SWOT analysis". Retrieved 2014-02-22. ^ a b Westhues, Anne; Jean Lafrance; Glen Schmidt (2001). "A SWOT analysis of social work education in Canada". Social Work Education: The International Journal. 20 (1): 35–56. ^ "Our Community". Retrieved 16 March 2014. ^ Birkenmaier, Julie (2001). The Practice of Generalist Social Work. New York, NY: Routledge. ^ Pittsburg, California tried this out recently with the BART program. Citation: (Document). Pittsburg City, California, www.ci.pittsburg.ca.us/Modules/ShowDocument.aspx?documentid. ^ "Urban Analysis of Urmia, Iran" (PDF). Reviste. ^ a b c Chermack, Thomas J.; Bernadette K. Kasshanna (December 2007). "The Use of and Misuse of SWOT analysis and implications for HRD professionals". Human Resource Development International. 10 (4): 383–399. ^ a b Quincy, Ronald. "SWOT Analysis: Raising capacity of your organization". Rutgers School of Social Work. Archived from the original on 2016-04-17. Retrieved 2013-02-25. ^ "Campaigners Toolkit: Strategy". The Change Agency. Retrieved 28 September 2017. ^ Menon, A.; et al. (1999). "Antecedents and Consequences of Marketing Strategy Making". Journal of Marketing. American Marketing Association. 63 (2): 18–40. doi:10.2307/1251943. JSTOR 1251943. ^ Hill, T. & R. Westbrook (1997). "SWOT Analysis: It's Time for a Product Recall". Long Range Planning. 30 (1): 46–52. doi:10.1016/S0024-6301(96)00095-7. ^ Koch, Adam (2000). "SWOT does not need to be recalled: It needs to be enhanced". Swineburne University of Technology. ^ Mesly, Olivier (2017). Project feasibility – Tools for uncovering points of vulnerability. New York, NY:Taylor and Francis, CRC Press, 546 pages, 9 ISBN 9781498757911. ^ "Value Line - The Most Trusted Name in Investment Research". www.valueline.com. Value Line Publishing. ^ "Synopsis: Silicon Valley - 'Homicide'". HBO. ^ Best source I could find is https://ceopedia.org/index.php/SWOT_analysis but seems unrelated. 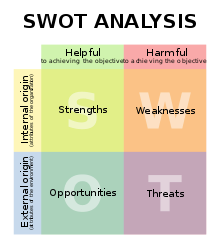 Wikimedia Commons has media related to SWOT analysis.